Mental and behavioral health facilities need to monitor and measure the quality of care they deliver. As administrators of these organizations well know, this is easier said than done. How does one go about evaluating the results of a large team of multidisciplinary providers treating dozens of patients a day? Clinical documentation, which can include progress notes and psychotherapy notes, is important because it allows mental health professionals to document and analyze conversations with patients during or after a therapy session. This documentation can serve as a basis for assessing improvements over time in individuals and groups. Stand-alone or “best-of-breed” software products exist for generating therapy notes. However, they are generally not as robust in terms of mental health outcomes reporting as are electronic health records (EHR) suites, which include other capabilities in addition to therapy notes, such as billing, patient scheduling and human resources applications. 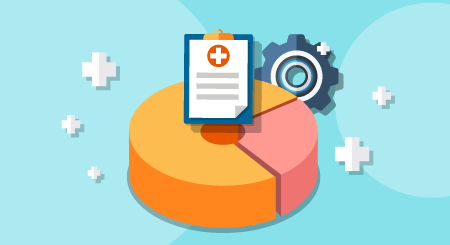 This is because EHR suites are capable of gathering more centralized data per patient encounter, making it possible to generate a greater breadth of reports without requiring duplicate data entry from the user. 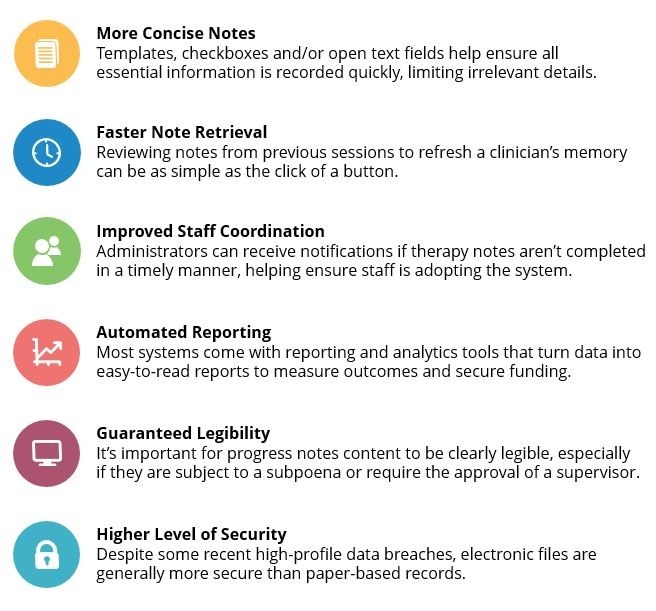 To help first-time or upgrading software buyers explore examples of some leading mental and behavioral health EHR suites, we compiled this guide showcasing prominent products, listed in no particular order. These systems were selected because they have been identified as market leaders in third-party research reports and have received good reviews by actual users on our website. Some of them have also been included in our latest FrontRunners for Mental Health. Check them out below. The Valant Behavioral Health EHR platform focuses exclusively on behavioral health. 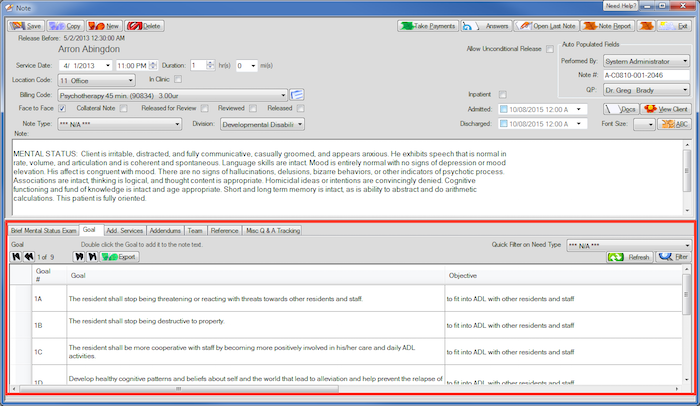 As shown in the first screenshot below, the left sidebar guides clinicians to complete notes one section at a time, prompting them to enter only the necessary information for each. Clinicians can work through sections in any order and, when they’re done, the system will automatically generate a narrative note that makes the information easier to read. Valant’s clean and clutter-free interface is designed to provide a mobile app-like user experience across every possible workflow. 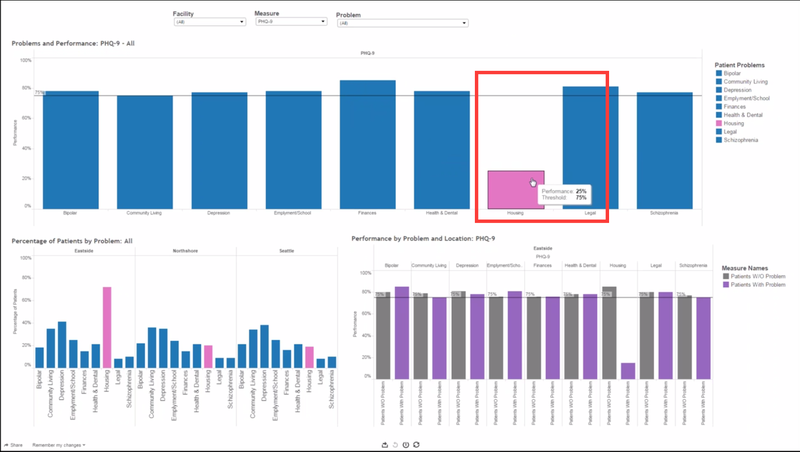 The second screenshot shows one of the software’s clinical performance dashboards, which allows administrators to see outcomes measurement data from their patient population. Valant partners with business intelligence vendor Tableau for its visual reporting user interface. The Valant platform is highly configurable to meet requirements for reporting to mental health authorities (e.g., state health departments) and to accommodate user preferences. This is done through Valant’s customer experience team, rather than through developers or engineers, so the needs of the medical staff are handled in a more agile and collaborative way. Providers can work with the team to customize each drop-down menu, form or workflow template. Clinician notes are entered in a structured data capture model. This makes it easy to aggregate data into a variety of reports for administrators to use to track health outcomes in a facility. 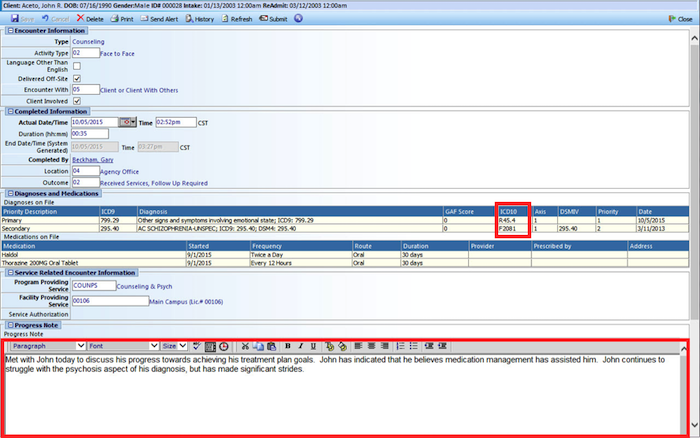 For example, the first screenshot shows a PHQ-9 that is directly incorporated into the clinical note. All information is saved in the patient’s chart and PHQ-9 scores are automatically graphed over time to reflect the patient’s treatment trends. Users of CareLogic Enterprise by Qualifacts can build their progress note when configuring their system to include several different clinical documentation formats. For example, the first screenshot below has active treatment plan goals and objectives included in the template, in addition to the PHQ-9 and a field for SOAP notes. 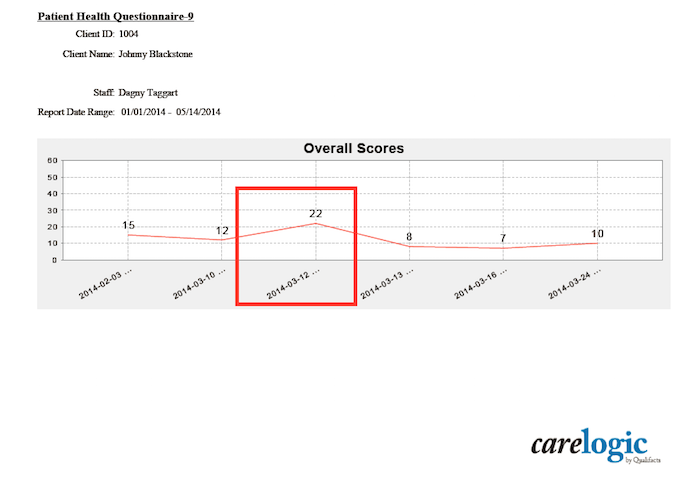 The report in the second screenshot below shows the progression of an individual patient’s PHQ-9 scores over time. 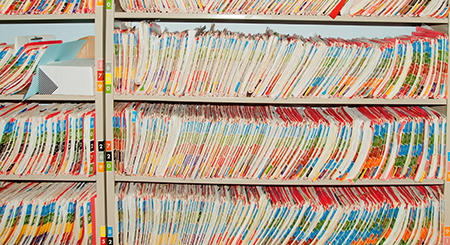 This type of report is embedded in a patient’s record for easy access. It can be printed and provided to patients, so they can take a more active role in tracking their own clinical outcomes. Automatic alerts are generated by the system to notify clinicians and supervisors of missing documentation or incorrect information. This allows any mistakes to be fixed before the billing office gets involved. CareLogic’s EHR suite includes an outcomes management tool, IMPACT, that allows clients to complete a variety of outcomes assessments. One such assessment is the DLA-20: a scale that defines successful functioning in 20 independent activities of daily living. 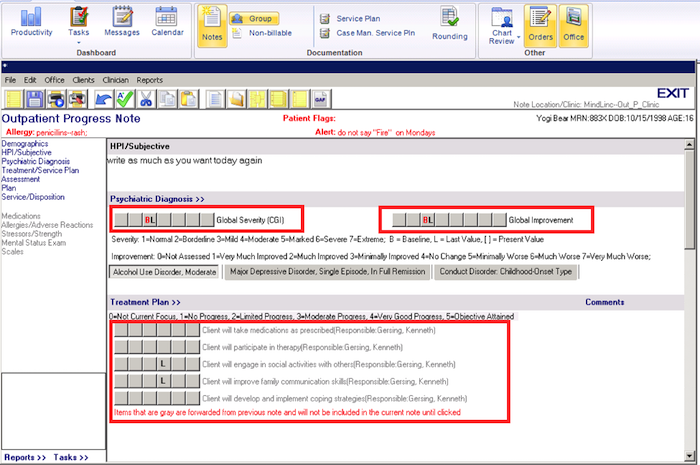 The user interface for entering a progress note in the myEvolv EHR by Netsmart consists of collapsible sections. This ensures important patient information, such as diagnoses and medications, is always at hand—meaning users don’t have to navigate away from the page to retrieve data. myEvolv can associate the content of a patient’s progress note with their treatment plan goals, and generate reports for managers to monitor health outcome metrics. The report in the second screenshot below shows how users can track the status of patient goals and whether they are being achieved for both individuals and groups. Once clinicians enter their progress notes and other relevant information (such as program admission and facility transfer data), the system’s integrated financial management functionality uses this information to automatically generate claims. This means staff won’t have to spend time on duplicate data entry or claims creation. Administrators can use this system to generate a number of reports for evaluating care metrics. These include client satisfaction ratings, changes in client level of functioning, length of stay, recidivism rates and reduction of adverse incidents. 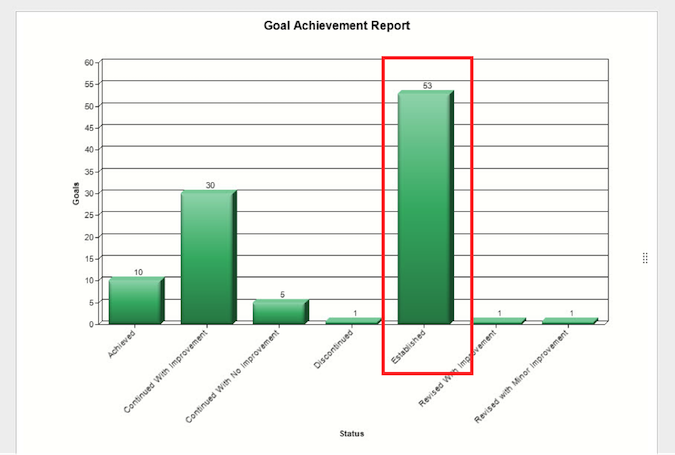 myEvolv can also track achievement of client goals and medication errors. MindLinc’s progress note template can be modified to include specific problems, goals, objectives and/or interventions based on a patient’s treatment plan. 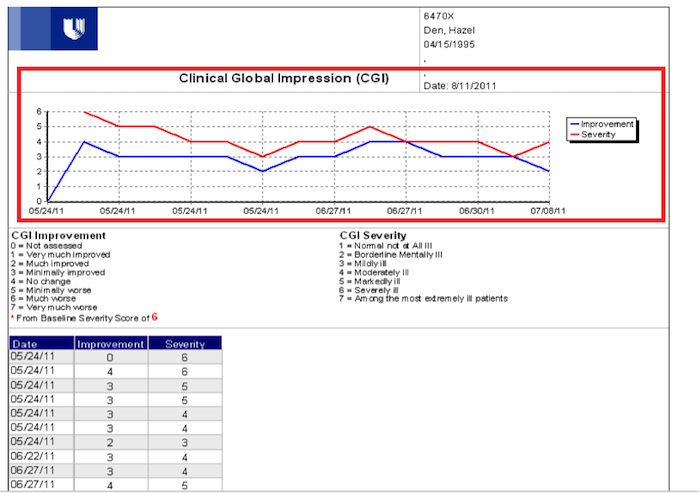 It also incorporates a variety of psychiatric outcomes scales, such as the Clinical Global Impression (CGI). For example, the report in the second screenshot below shows an individual’s progress using the CGI scale. Two color-coded lines represent a patient’s improvements and the severity of their symptoms over time. System-wide due date alerts can be set for clinicians, prompting them to turn in treatment plans and updates. This can make it easier for staff to manage their time without worrying about tasks falling through the cracks. Administrators using MindLinc can automatically generate outcomes measurement reports that incorporate patient data, such as treatment plan progress, symptoms, side effects, stressors and suicide risk factors. 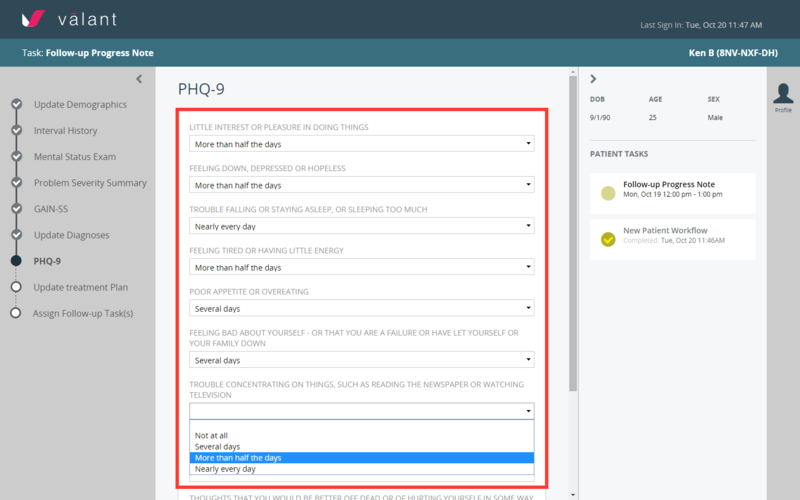 PIMSY’s progress notes can be accessed right from a clinician’s appointment calendar for easy navigation, and the note templates have built-in spell-check functionality. Administrators can set parameters for the system to fit their needs, such as controlling the types of billing codes users can access. Automating the progress note documentation process makes running reports significantly easier than when aggregating the data from paper records, because all the data is already centralized and stored in a digital format. Depending on staff preferences, notes can be presented in different formats. The system lets users write text-heavy, narrative notes or fill out program-specific forms that have been customized to their specifications. For example, a standard patient note may be modified to include question-and-answer fields, drop-down menus, radio buttons, free text and more. PIMSY can either make these customizations remotely, or train staff to make customizations themselves. PIMSY can generate more than 55 different reports based on data captured in the system. These include monthly billing reports and a printable transaction summary, which gives a detailed list of all the payments and charges made on a patient’s account. The report in the second screenshot below shows a rundown of all clients seen in a certain time period. Now that you’ve seen a small sample of the hundreds of EHRs out there with robust therapy note and reporting functionalities, it’s time to narrow your scope even further. Factors such as pricing and implementation time frame will play a major role in your ultimate purchase decision, but that can be difficult to ascertain through internet research alone. Luckily, our team of mental and behavioral health software advisors provide fast and free phone consultations, with no obligation, to help you determine the best system at the right price for your organization’s needs. Call us at (844) 686-5616 for a free consultation with a software advisor. Share this advice with your colleagues!